Congratulations to Jason Young who has... eventually... won Event 17, $1,500 No Limit Hold'em Shootout, taking home $335,565 and the small matter of the gold, shiny bracelet. And on that marathon-ending note, we shall bid you farewell and thank you for following our coverage. Schwartz raises to 700,000, and Young reraises all in. Call. Just like that. And it's a gigantic, bracelet-sized coinflip. 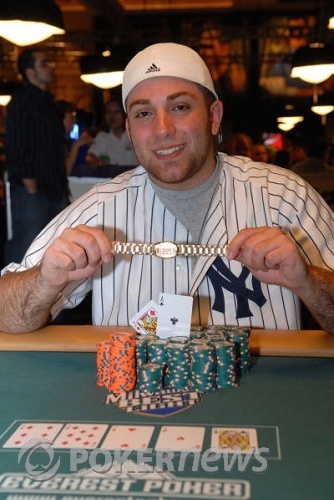 And after one of the most impressive and dramatic comebacks ever, it's all over for Michael Schwartz, and a massively relieved Jason Young can finally pick up that bracelet and take it home. The pace has slowed down considerably now and most of the onlooking spectators have now departed to seek their entertainment elsewhere. The last two hands echoed the current mood. After checking down an board, Jason Young took the pot by betting the river. "Can you beat the board?" inquired Mike Schwartz. "Because I can't." The very next hand, the board was checked down again, including the river, Young's taking the pot with a on the felt. Schwartz raises to 500,000, and Young reraises all in. Schwartz stands up, and contemplates. Eventually, he folds face-up. Young shows A-6. During one on the double ups, Jason Young turned to the dealer he ambushed earlier and announced, "I'm not kissing you again." Either he doesn't believe the dealer is as lucky as he first thought, or maybe she slipped him the tongue. After a few small scuffles, during which time Michael Schwartz calmed down a little, and Jason Young began to look increasingly frustrated, eventually they got their chips in. Young raised all in from the button, and said, "Oh sh*t!" when Schwartz insta-called. 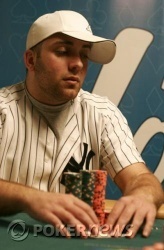 Schwartz has somehow doubled through again, up to a respectable and bracelet-contending 3.4 million. Jason Young is most unhappy. The following two hands, Mike Schwartz pushes all in twice in a row, and it's enough to make Jason Young fold both times.